In addition to the prints your guests take away with them we provide online galleries for all of our events right here on our website. Simply choose your event from the dropdown below and enter the password that we have provided to you, sit back and enjoy the antics of your friends, family and other guests. 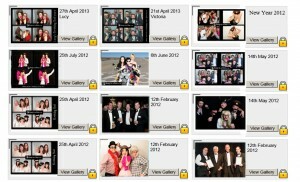 Use the sharing links below to share our photo album gallery page with your guests. Additionally, if requested, selected photos may be available on our Facebook page, please encourage your guests to stop by, tag themselves and leave some comments.